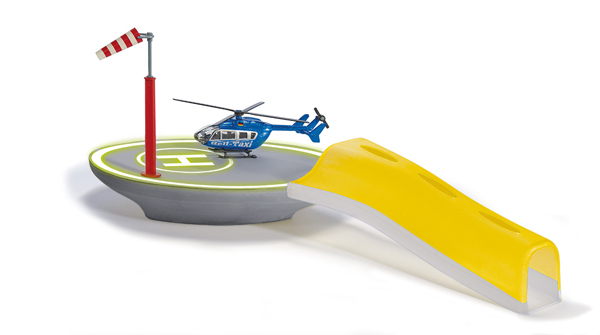 The new Heliport provides optimum landing opportunities day or night, for 1:87 and 1:50 scale helicopters. For flights late in the evening, the landing platform is printed with a luminescent colour which illuminates for a few minutes after the room lighting has been switched off, so that helicopters which arrive somewhat late are also able to land safely. The Heliport can either be integrated into the SIKUWORLD or used outside of it. This is made possible by the special design of the baseplate, which can stand on carpet or table without additional means. If the insert on the underside is reversed, the well known SIKUWORLD connector becomes available, so that the landing place can be securely connected to the SIKUWORLD system. The access to the landing place can be traversed by vehicles up to scale 1:50 as can the landing platform. If the vehicle is too high, it is easy to remove the roof of the entrance, so that access is possible for a minibus taxi (1938) or an emergency vehicle (2108) A helicopter with " HELI TAXI " marking in 1:87 scale is provided as an accesory to the set. Model Construction : Die Cast Metal and Plastic.